This is a sampling of the tuners I typically install on guitars. I can get and use other tuners, but these are the main ones that I recommend and use on my personal guitars. These have the best turning motion, last the longest, have a flat base that makes full contact with the headstock, and look good. The only thing that keeps me from recommending them is that they're expensive. My cost is $125-150 from Stew Mac and by the time you add in conversion bushings and installation, you'll be looking at close to $200 for a set of these. Still, if you want to pay the bucks, Waverlys are the best overall tuner. Gotoh Open Back: I probably install more of these than any other tuner. They work well and I haven't had any failures or any issues with them. The cost is about $100 less than Waverly tuners. They come in scalloped or oval tuner buttons, nickel or gold. Grover 18:1: This is my 3rd most popular tuner. They have a higher 18:1 ratio than the 14:1 ratio of most of the other tuners and consequently feel "smooth" to most people. Others complain that it takes more turning to get in tune. I have had failures with the early version of this tuner and I don't feel that the construction is as robust as the Gotoh open backs. Newer versions use a different construction and seem to be holding up well. They come in nickel or gold. Newer versions- note the back plate in comparison to the older ones below. Older versions. Note the slotted back plate- this is where failures occurred. 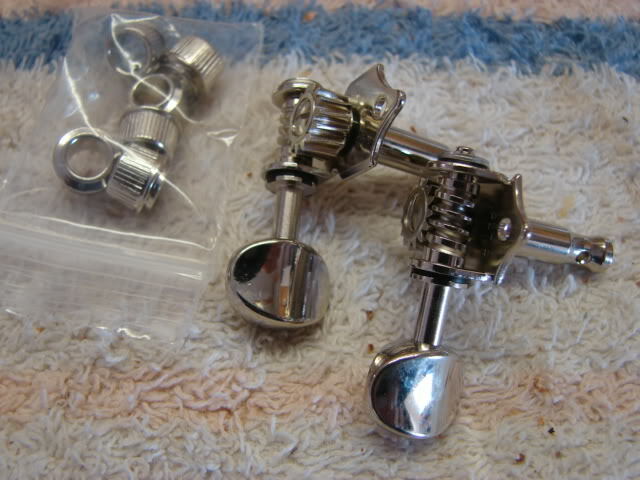 Kluson tuners were used on a lot of old Martins and these are Gotoh's copies of those tuners. They have low shafts, work acceptably, and are relatively inexpensive ($25-35). 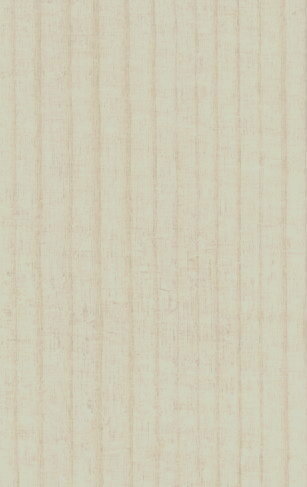 They used to come stock on Santa Cruz and Collings guitars before the development of Waverlys. 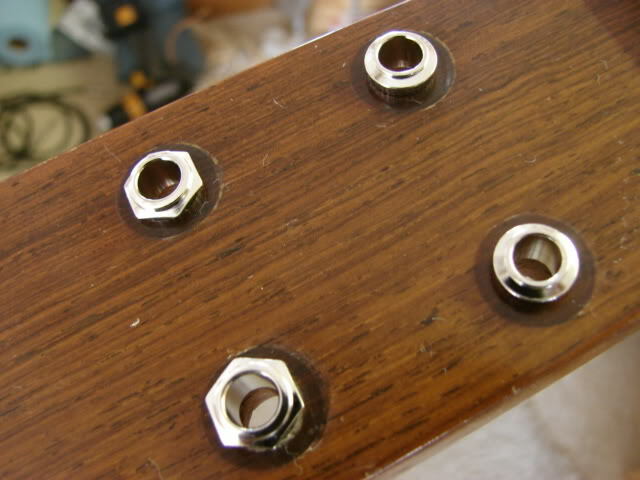 The disadvantages of these tuners are 1) the tuners will typically last about 5-10 years before they get loose, 2) the base is "cookie-cutter" and doesn't make full contact with the peghead, plus it'll cut an imprint in the finish/wood. I use these tuners when they're a direct fit for old Martins that used Kluson tuners (Waverlys have a slightly different footprint). They come in oval or scalloped buttons. This is a set of open-back Klusons from a '50's Martin. I get a lot of questions about these and the unfortunate fact is that there is not a good replacement for these. Their footprint is a little different from anything on the market. These are the kind of tuners I take OFF. They're heavy, they have a lot of parts that get loose, they're ugly, the shafts are tall. They do turn smoothly (until they don't...). Tuner Weights- which would you rather have on your headstock? Grommets: If I replace your Grover Rotomatics, I'll use Stew Mac's conversion bushings to fit in the oversized tuner holes. You have your choice of hex or round grommets. Hex is more 30's vintage and round looks better with the raccoon eyes that often result from the Rototmatic bushings.